The input of text into a computer system is one of the most common and important channels for humans to interact with a system. This essay provides a brief overview of text input devices. However, literally every input device could be used for this task, even one button would be sufficient, when it is used as a Morse key. Therefore the scope is limited to devices, whose primary purpose is the input of text directly (so, for example, a flat bed scanner with OCR software or voice recognition software is not included). Furthermore this document focuses on the usability for the user and not technical issues - as how the devices work internally. The included devices are namely in chronological order: Punch cards, keyboards in general, the stylus for PDAs or TablePCs and, as a more recent device, the chording glove. In the beginning of the computer era, text among all kinds of data was inserted into a computer system by directly manipulating the memory (for example by rewiring an array of contacts) and therefore binary. The first step in the direction of more natural text input were punch cards (-> figure 1), simple cards made of stiff cardboard with (most commonly) 80 columns of defined positions printed on them. To represent data with such a card, rectangular bits of paper needed to be punched out at these positions. Thus, each position in a column represents one bit of the binary number stored in column. So cards could save up to 80 characters (one line) of text and were not only used as text input devices but also as data recording media. Users could now enter data by typing on a machine called "keypunch", which punched out the according bits of paper, and thus in a much faster and more intuitive way than before. The keyboard-layout of such a machine was adopted from traditional typewriters (plus some keys for card-management) and so nearly the same as on modern keyboards. With the availability of disk storage systems, punch cards went out of fashion and keyboards took their place - and keep it to this day. The basic advantage of keyboards over punch cards is, that they allow direct interaction with the computer system without intermediate steps by directly notifying the computer as soon as a key is pressed. Furthermore, traditional keyboards are still the fastest known devices for text input and so are not likely to lose their dominant status in the near future. Nowadays keyboards come in different styles and forms ("ergonomic", asymmetric shaped keys, with multimedia-keys, foldable, illuminated, ...) but most commonly still share the layout of traditional typewriters (namely the "QUERTY"- or in Germany the "QUERTZ"-layout, named after the first row of keys); though different, perhaps more usable, layouts for the key-arrangement on keyboards were invented (-> figure 2), but couldn't stand against the existing standard. Differences to this old design can mostly be found in the addition of extra keys, for example arrow keys or keys, which are supposed to control programs like media players or internet browsers. A special class of these devices build the keyboards, which are integrated in necessarily small computers, like mobile phones or PDAs: Due to the limited space there are much less keys available. To provide the user nevertheless with the functionality of a full-size keyboard, these devices need to assign each key with more functionality - which makes the process of entering data harder and slower. Even on gadgets, which provide no space at all for an appropriate keyboard (e.g. PDAs or TabletPCs), the keyboard-design is used to enter text: Instead of physical keys, the keyboard is displayed on the touchable screen of the device ("on-screen keyboard"). Although most users have no trouble finding the keys due to the well-known layout, ease of use and typing-speed are still poor in comparison to a physical keyboard, mostly because of the missing tactile feedback and the smallness of the buttons. This matter is especially of significance with the small displays of PDAs, where the keys become so tiny, that even small fingers couldn't operate them. Also the usage of a stylus (-> figure 3) with the on-screen keyboard doesn't really improve this situation very much. 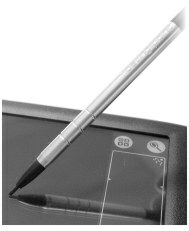 But used in a different technology, the stylus can be used as a quite powerful text input device: In combination with a character-recognition software such as "graffiti" by PalmOne enables the user to write on the screen in a way similar to natural handwriting. Though the user still needs to learn to write the characters in a (for the computer-software) understandable way (or even nearly a new alphabet), after this training period most users are able to enter text in a quite reliable and fast way. Additionally this way of text input doesn't need any valuable space on the graphical user interface as an on-screen keyboard does. An even more mobile way of entering text is the usage of special data-gloves (-> figure 4). These devices are used with one or both hands to enter text either by measuring accelerations/rotations of the forearm and flexations of the fingers (gesture recognition) or in a more traditional way by working as a keyboard, whose buttons are attached to the glove - or combinations of these. Gloves, which are able to recognize gestures, could proof especially for disabled people, who depend on communication through sign language, as extremely valuable; actually built prototypes and commercial products, however, suffered from a very little set of gestures the systems could understand and were quite expensive, but achieved good input-speeds. Gloves with attached buttons are much cheaper to build and need no extra computations, but are restricted to a small number of keys; therefore the simple mapping "one key (plus Shift/Control) -> one character" of ordinary keyboards can not be used. Instead a technique called "chording" seems suitable: A character is typed by simultaneously pressing multiple buttons like musicians playing a chord on a trumpet. In this way, it is possible to type all standard letters plus some control inputs (e.g. 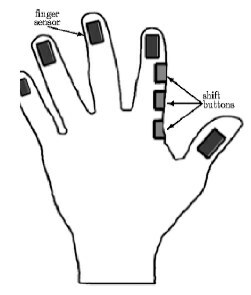 <space> or <return>) with just one button at each finger of one glove by just pressing the fingertips on any surface; with two gloves of this kind there are far more possible input-combinations than a common keyboard provides - and a user is able to remember. Alternatively additional shifting-keys reachable for the thumb can enlarge the amount of typable characters.